Mutiny on the the high seas! I do not yet know for sure the birthplace or parentage of my 4th gr-grandfather Daniel Hartwell of Topsfield, Essex County, Massachusetts. He was most likely born in Conway, Mass. 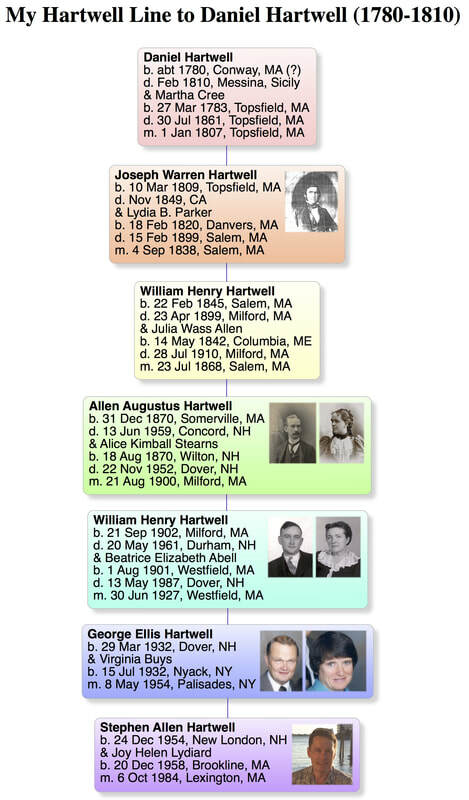 around 1780, and is almost surely connected to the Hartwell clan of Middlesex County, whose immigrant ancestor (1636) was William Hartwell of Concord, Mass. Here is a pedigree chart that shows how I descend from him. The first known record I have for Daniel places him in Salem, Mass., in October of 1802, ready to embark on a three year, around the world sealing voyage to ports in the Pacific and Canton, China, as a 22 year old green hand aboard the ship Rachel. From Salem court records following the voyage, Daniel won a judgment of nearly $400 from the ship's owners. In the archives of the Phillips Library of the Peabody Essex Museum, I unearthed ship's papers from the Rachel detailing how young Hartwell extorted large sums from the captain by threatening to mutiny. Following his adventure on the Rachel, Daniel took a wife, Martha Cree, and settled in neighboring Topsfield, Mass. They produced two boys, Daniel, born in July, 1807, and Joseph, born in March, 1809. Daniel Sr. then took to the seas again aboard the Brig Louisa on a trade voyage to the Mediterranean. After locating a newspaper account saying that he died at sea, I again turned to the Phillips Library to discover an account book of the voyage, which outlines some further details about Daniel's untimely demise at only 30 years of age. Daniel's widow Martha was left with the daunting task of raising their two infant sons alone. She was fortunate enough to find a new husband, Jacob Towne, bear him a daughter Angeline, and live well into her 70s. If you would like to read more about Daniel's story, both tragic and triumphant, click on any of the four links below.